Raising high above the valley floor this rustic gem rests in a gentle glade of aspens and holds watch while the metro plain lights up as darkness falls. The terraced kitchen, dining and great room is the center piece for the views of your sunrises, sunsets and glittering nights. The classic, natural stone fireplace graces most of one wall below your open beams and vaulted cedar ceiling. The ranch floor plan is a sought after rarity in our mountain communities. Prime upgrades within the last 5 years are Anderson low E windows, roof, septic, well (domestic rated for irrigation), cellular blinds and a bath update. A dual forced air, natural gas furnace system and a sunny plateau above the granite outcrop will keep you cozy and warm through a Colorado winter. 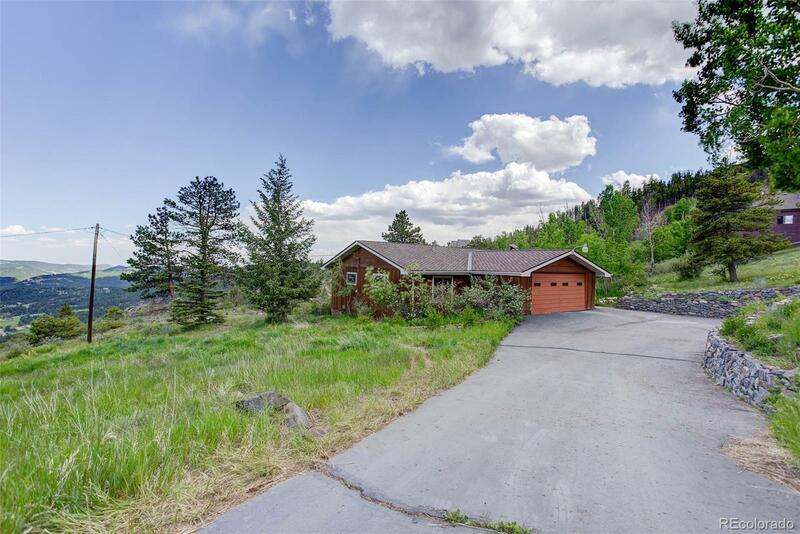 Just minutes to I-70, you are offered a quick Denver metro commute or a head start to the mountain adventures and skiing to the west. The highly regarded Clear Creek Middle and High school is virtually a walk below.